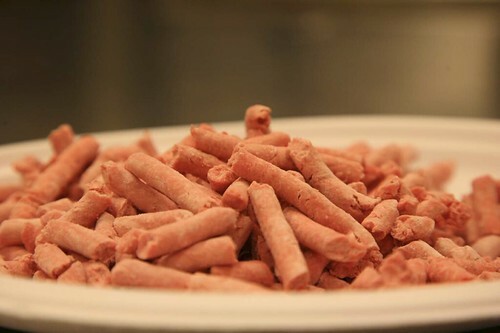 Perhaps, you may have read that “Pink Slime” is meat trimmings scooped off the floor of packing plants or it is “filler” that is unsafe for consumption. As cuts of beef-roast or steak- are prepared for the meat case, the lean meat is separated from fat trimmings. Food handling facilities utilize every portion of the beef animal. 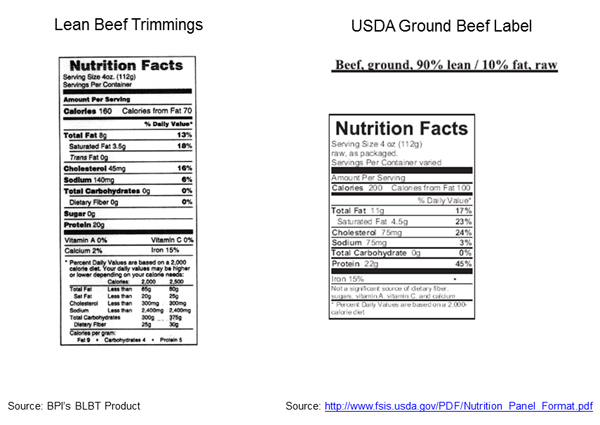 The process of separating fat from the lean meat yields 10-12 pounds of lean, nutritionous beef that is inspected by United States Department of Agriculture (USDA). Dr. H. Russell Cross, Professor and Animal Science Department Head of Texas A & M University, was the administrator of the USDA Food Safety and Inspection Service when LFTB was approved. Simply put from this Beef farmer, Lean Finely Textured Beef is 100% USDA Inspected Beef. It will not appear as a separate ingredient on your Ground Beef label because it is BEEF not an chemical-engineered additive as presented in the media. This week, the Harvard School of Public Health (HSPH) release a study claiming red meat consumption causes “premature death”. Without missing a beat, the media began reporting the findings of the study after it was published online in the Archives of Internal Medicine. The study tested more than 37,000 men and 38,000 women through surveys and questionaires. On the surface this statement grabs your attention and makes you rethink the hamburger. However as a person who cooks the majority of the meals in the family, it is important to take an in-depth behind the study look. This Harvard Study asked 37,000 men and 38,000 women through a questionaire every four years and documented deaths of the group during the twenty year period. No lab work completed; no Research 101testing -just a simple question and answer scenerio. As Dr. Shalene McNeill, a licensed dietician, points out this is an “observation study” where a cause/effect relationship cannot be established. “How did the researchers test the dangers of meat? Through a survey and questionnaire. This wasn’t some deep and complex lab work. An observation study without randomize controlled trial is just a published thought. I make dietary choices based on facts not studies that waste valuable resources. As I published in my previous blog post, a randomized controlled clinical study by Pennsylvania State University conlcuded participants following a BOLD (Beef in Optimal Lean Diet) and BOLD-PLUS diet experienced a 10 perent decrease in LDL Cholesterol. Remember 3 ounces serving of lean beef contains approximately 150 calories packed with essential nutrients: protein, zinc, vitamin B12, vitamin B6, niacin, selenium,phossphorus, choline, iron, and riboflavin. So fire up the grill and select one of the 20 lean cuts of beef. Remember, a healthy lifestyle is about portion control, a balanced diet, and exercise. Warm Spring Weather Sprouts Bad roots @ Beef | AGWEB.com. I an American Farmer, urge you to start a real dialogue about the America’s Food System with me. For you see, today-October 24, the Center for Science in the Public Interest (CSPI) has declared it Food Day. For me, Food Day is 365. Disappointingly, instead of having an honest conversation with farmers, the CSPI has chosen to organize a campaign that spreads untruth about the way I raise my crops and animals to feed you. Every day, I thank God for giving me the skills and natural resources to produce safe, abundant, healthy food for my country and the world. As a parent and consumer, I only support agriculture practices that are safe for my family and yours. I raise corn, soybeans, and beef animals on my farm. I recognize the need to seek improvements, embrace new technology, and invest in continuing education to improve my part -the beginning- of food production to yield healthy choices to people everywhere. Unfortunately, the CSPI purposely leaves one valuable nutrient-rich food from its list of healthy food choices –Beef, Pork, Lamb (Only seafood, low-fat dairy, and poultry). It is implied by the CSPI that animal proteins [excluding low-fat dairy and poultry] are unhealthy. The 2010 Dietary Guidelines-My Plate, My Health– recommends a balanced diet from all food groups-Fruits & Vegetables, Grains, Dairy, and Protein- combined with physical activity for a healthy lifestyle. The USDA’s Dietary Guidelines for Americans encourage people to “get more nutrition from their calories” by choosing nutrient-rich food among all food groups. The Meat and Bean group provides protein but not all proteins are created equally. Unlike most plant sources of protein, animal proteins such as lean meats supply’s most readily accessible and easily absorbed source of iron and zinc-essential nutrients for muscle growth and good health. Meat can help you to get the most nutrition-Protein, Iron, Zinc- all wrapped up in tasteful serving. Lean meat like Beef can help you get the most nutrition for fewer calories. Calorie for calorie, lean beef is one of the most flavorful and efficient ways to meet the daily value for 10 essential nutrients like iron, zinc and B vitamins and beef also provides 20 grams of protein per serving. The fact remains most Americans including myself need to make better food selections, strive for portion control, and just simply get off the couch more. My family is proudly among the 98 percent of U.S. Farms that are operated by a family or individual. As a ninth generation farmer, protecting the environment and my animals are a priority. The decisions my family makes on the farm is based on peer-reviewed science that is verified and respects the consumer values. I urge you not to partake in questionable campaigns like the CSPI’s Food Day but engage in conversation with Real Farmers. It could be as simple as visiting a local farm or participate online- join the honest Food Dialogues everyday.